If you’re looking for an easy way to get more vegetables into the mouths of your family, this is it. I’ve got a houseful of picky eaters. Myself included. 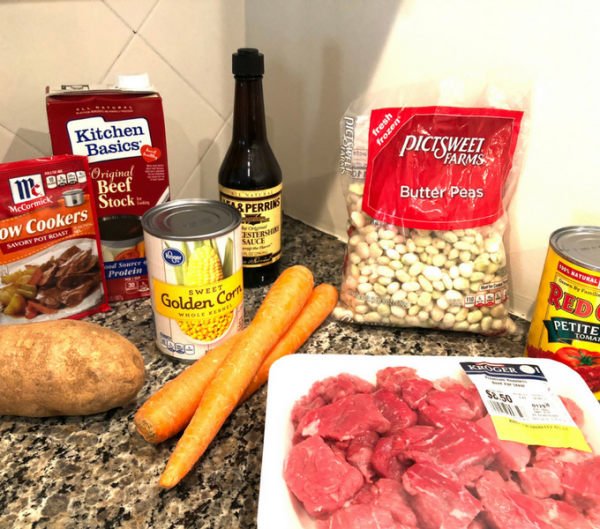 And I’ve created a hearty and healthy meal that everyone loves – Homemade Vegetable Beef Soup. 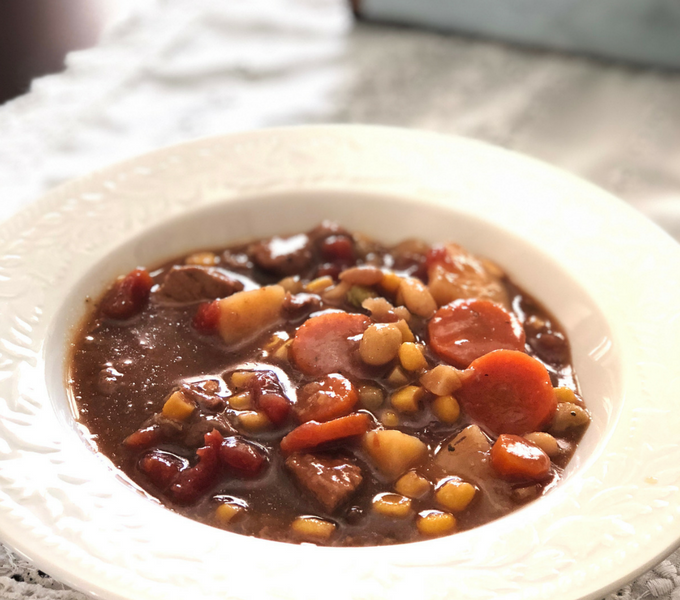 It’s tried and tested in this house and it’s a perfect meal for these cold winter days and it’s good for you – win, win! I’m so happy to be joining Aimee here at Crazy Craft Lady! I’m Melissa and I’m the writer at Brown Dog Vintage where I share budget friendly home decorating ideas, DIY projects, room makeover, and more. 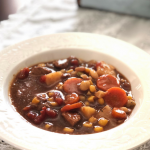 I don’t often get the opportunity to share a recipe and this one is too good not to share! We have a busy household full of picky eaters and trying to get healthy meal options is a bit difficult sometimes. But this one nails it. Healthy, hearty, full of veggies and protein, and you get plenty of leftovers. It takes a few minutes of prep and then that’s pretty much it. It simmers for hours and the bonus part is your house will smell amazing the whole afternoon! Delicious and packed full of veggies and protein - it'll be a crowd pleaser for sure! Peel the carrots and cut into 1/2 inch rounds. Peel the potatoes and cut into 2 inch pieces. Drain the canned corn and rinse with cold water. Measure out 1&1/2 cups of frozen butter peas. With a whisk, mix the beef stew seasoning packet with about 1/2 cup of beef stock. Heat 2 tablespoons of canola oil in a large dutch oven over medium high heat. Add the beef and sear for about 1 minute, stir around and sear for another minute. Add all your vegetables to the pot. Use about 2 teaspoons each of salt and pepper. 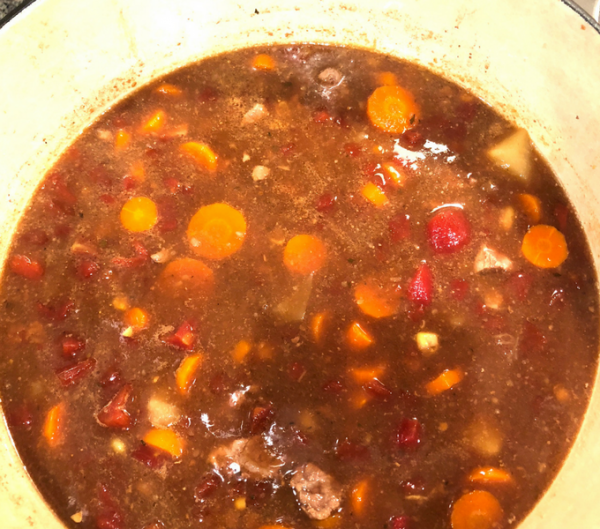 Pour the seasoning over the beef and vegetables, add the rest of the beef stock, making sure all ingredients are covered in liquid. Add 3 teaspoons of Worcestershire sauce. Stir everything well and put the lid on completely. Simmer on low for 3&1/2 to 4 hours. When I made this last time, I only had one can of corn and one can of tomatoes, but it’s definitely better with two each. 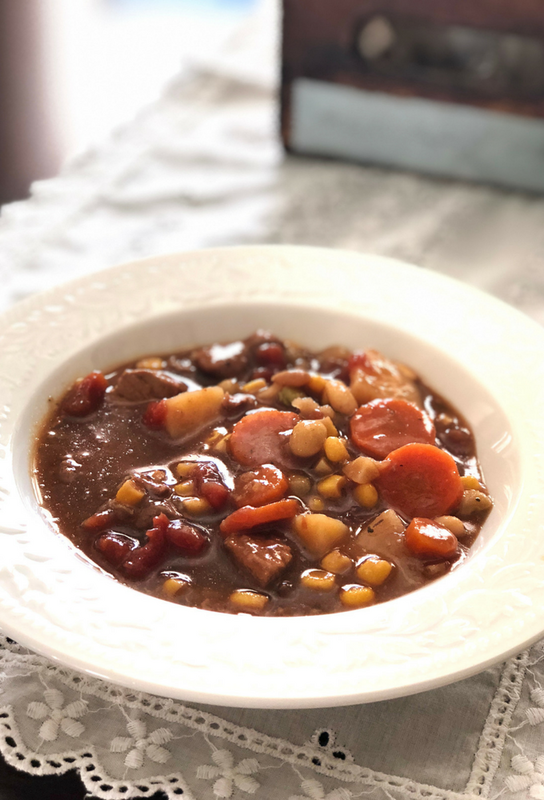 It feeds an army, and my kids love this meal! We serve it with simple saltine crackers or corn muffins. 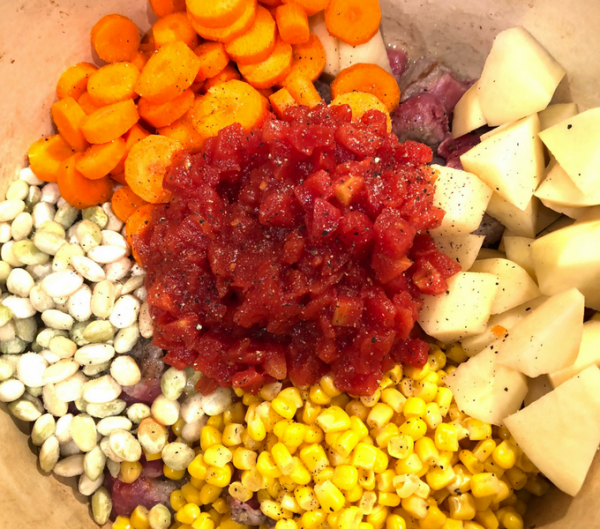 It’s perfect for cold winter days and it has several servings of veggies in each bowl! 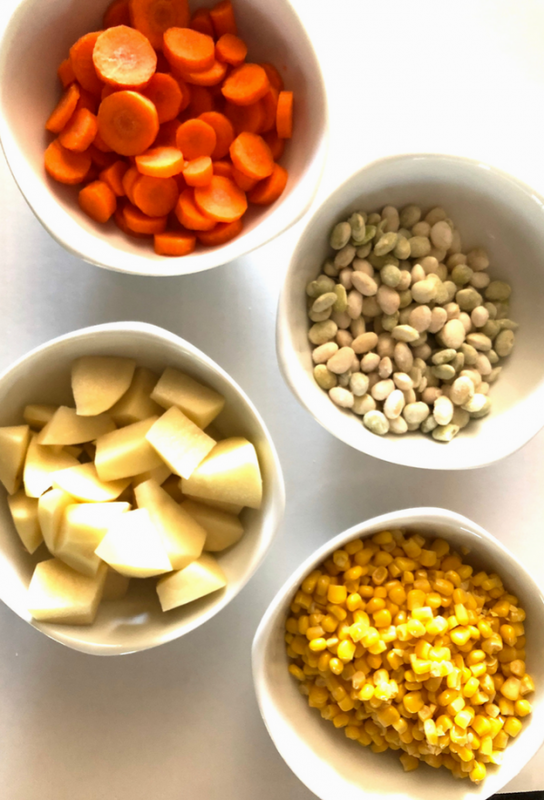 You can add as many different types of veggies as you’d like, and if you’re vegetarian, you can skip the beef and use vegetable stock instead of beef stock. We can easily get 3 servings each for my family of four out of this meal. And it takes very little time which is always a plus for busy families! Enjoy!